Shell Cushion is a beautiful cushion with ruched pattern in Grey. Dimension: 43cm by 43cm .. Shell Cushion is a beautiful cushion with ruched pattern in ivory.Dimension: 43cm by 43cmCol.. Shell Cushion is a beautiful cushion with ruched pattern in Mocha. Dimension: 43cm by 43cm .. Shell Cushion is a beautiful cushion with ruched pattern in Olive Green. Dimension: 43cm by..
Silver Detail Sequin Swirl Cushion is a traditional and stylish cushion cover that livens your class..
Small Mocha Cushion Quilted and Studded with Pearls is a unique cushion for a stunning sofa.Di..
Red Cushion Quilted and Studded with Pearls is a unique cushion for a stunning sofa.Dimension:..
Gold Sequins cushion is traditional and stylish cushion cover with sparkling design. This cushion is..
Grey Sequins cushion is traditional and stylish cushion cover with sparkling design. 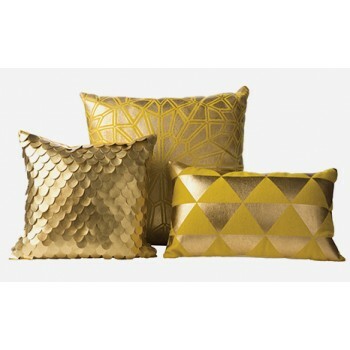 D..
Orange Sequins cushion is traditional and stylish cushion cover with sparkling design. This cushion .. This Cushion comes in a rich Stripe colour in red, purple and orange on a brown background.. This Cushion comes in a rich Stripe colour in Green, Purple, Blue, and Teal Green on ..
Viva Crinkle Cushion Fuchsia. This item is sold in both filled and unfilled options.Dimension &n..